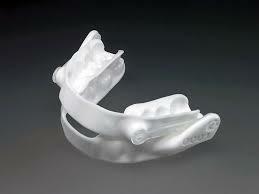 The SomnoMed appliance is a two piece appliance consisting of upper and lower trays similar to mouthguards. The lower tray has "wings" which are held forward by adjustable blocks on the sides of the upper tray. 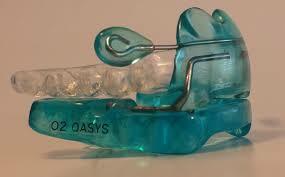 The appliance holds the lower jaw in a forward position allowing for airway to remain open during sleep. 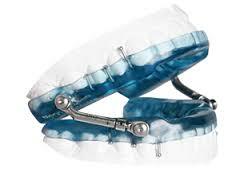 Variations include ball clasps on the front of the appliance with bands that hold the jaws together, further aiding in the opening of the airway. The SomnoMed is great for patients with a grinding or clenching habit. 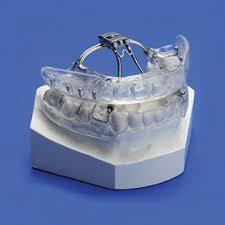 The Narval appliance is made up of two hard polymer trays connected by plastic positioners. 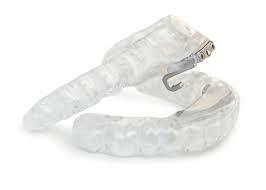 The Narval is metal-free and patients can truely talk and drink while wearing the appliance. Lightweight and easily adjustable, the appliance is perfect for patients who are on the go. 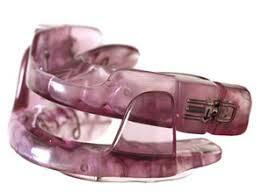 It works well to treat mild to moderate sleep apnea and snoring.